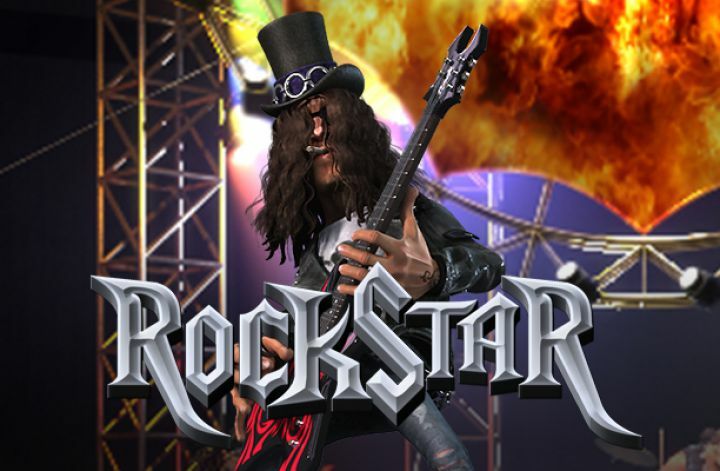 Here’s your chance to be a star, a rock star in the RockStar slots game. You’ll have fun having both fame and glory and live in luxury while hanging out with groupies, travel first class and have the best custom-made instruments, just like the real superstar bands. And just imagine, you’ll be able to wear whatever crazy outfits you want, such as a formal top hat with jeans and sports shoes, anything you want, and the fashion police will not criticize you. Oh, yeah, don’t forget the money! There are a lot of symbols in this game, such as gold records, expensive booze, magazine covers, concert tickets, very grungy-looking male vocal performers, the mandatory blond female, and more. The obvious theme of RockStar slots is music, rock music, hard rock music with lots of screaming guitars, and guitar solos. The main screen and backdrop is a stage with the musicians and singers in the foreground under flashing and twirling stage lights. The hefty soundtrack includes some easy-going guitar riffs which serve as a needed break to your ears and senses from coast to coast rock riffs. There are even some animations presenting scenes where the musicians get ready for their performance. Sometimes you are prompted to play along, sort of like a guest star performer; and sometimes you can just relax and simply listen to the music. Soon, you may feel like you are present at a real performance by the band because the soundtrack is so good. The game’s objective in Rockstar slots is to match symbols on the paylines and reels in such a pattern as to give you a win or special prize. It takes a minimum of three of the game’s symbols to earn a prize or special opportunity to win a prize, such as Bonus Rounds. The online version of RockStar slots grooves on a five-reel, thirty payline play screen. This is enough to give you good winning opportunities. The special symbols in the game allow you to trigger hidden features and opportunities to achieve winning combinations. For example, landing three or more guitars on the active payline triggers a unique feature called Epic Solo. Once it’s triggered, you are prompted to select one of the platinum or gold record symbols. They hide a Bonus Feature. They also serve as the Wild symbols. Wild symbols traditionally assist you in getting a winning combination by substituting itself for all the less powerful symbols on a payline, except for the more powerful Scatter Symbol. Often this can result in further triggering a multiplier to enhance your winnings by multiplying your bet. A platinum record has a 5x multiplier, while a gold record nets you a 2x multiplier. If by chance, you net both a gold and a platinum record on a single active payline, your payline bet gets a 10x multiplier. The best way for you to get large payouts in RockStar slots is to win constantly during the Bonus Spins because the game lacks a progressive jackpot. Occasionally, you can grab a bigger than usual payout during the base game. Members of the band are friendly and can help with some sizable payouts. The blond lead vocalist can present you with 500 coins for every coin you bet for each spin. The other performers can get you 400 coins. If you combine a Wild symbol with a musician, you will trigger a 10x multiplier. The same is true if you match a gold record with a platinum record. The maximum win per payline is 5,000 credits. Lots of money, and gold and platinum records to boot. BetSoft loaded the game with a great soundtrack of rock music, voice-overs, stage antics, animations, and more. You certainly won’t become bored while playing this game. There are also many chances to win and win big while you’re fantasizing at the tempo of four beats to the bar. All in all, I would say this is a very entertaining slots game if you are an avid music fan or are particularly a rock ‘n roll music lover. Beethoven lovers should probably steer clear, although the soundtrack, as in most modern games, can be turned down or even muted. RockStar slots is, however, a great fantasy odyssey to take when you feel the need to star in your own rock band.